Quinn first “performance” was at the age of 3, when she ran up onto the stage during a performance of Cinderella and had to be escorted back to her seat by Prince Charming’s valet. Since then she has never passed up an opportunity to get back on stage and has since performed with companies all over the lower mainland. 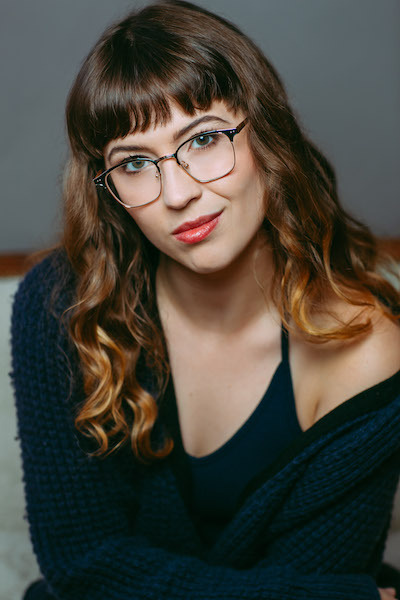 Quinn’s professional career began in high school when she was accepted into Vancouver Youth Theatre’s acclaimed touring teen shows “Say Peace 2” and “Echo Freedom”, where she served as both writer and performer. Both shows toured to high schools across the lower mainland and highlighted social justice issues from the perspective of teens. Quinn wrote several pieces about cyber bullying, racism and protecting the environment, all issues close to her heart. She continues to write essays and plays to this day (including her one-woman TYA show “#FrogFacts”). Quinn continued to work in the theatre community as a singer and an actor throughout her teen years, playing roles such as Sandy in Grease, Kendra in 13 and Meg March in Little Women. Her favourite role came at age 18 as Laurey Williams in Oklahoma! at Royal City Musical Theatre while she was attending UBC. After an award-nominated performance, with the encouragement of her directors, teachers and peers, she dropped out of UBC and auditioned for the prestigious acting program at Studio 58, where she was accepted. Quinn graduated the program in December 2016, where she was able to dig deep as an actor playing roles such as the hopeless, poverty-stricken Sandy in George F. Walker’s “The Crowd” to the ignored, mistreated prophetess Cassandra in “Troilus and Cressida” and even the voice of a poodle in “Madame Bovary”. She continues to perform all over the city.